I would like to offer an enormous thank you to Kathy at Still Life With Birder, Mia at On The Wing Photography, Featherfields, Birder_Katie, David at A Calgary Birder, Bob at Birds Calgary, Bob Parsons from the Edmonton Nature Club, and readers Susan and Richard for their recent donations to my Baillie Birdathon campaign. I am grateful for all the wonderful donations and amazed to have raised almost twice my goal. Thank you all so very, very much. As a reminder, half of the money I raise will go, as I have designated, to the Long Point Bird Observatory in Ontario, which does very important work in Canada. The other half of the money goes to Bird Studies Canada; and the James L. Baillie Memorial Fund for Bird Research and Preservation, for amateur ornithological research within Ontario, and “projects by individuals and organizations that increase understanding, appreciation and conservation of Canadian birds in their natural environment”. Thank you to everyone for your wonderful support! Now that it is May, I’m getting very excited for the Baillie Birdathon, and am also excited because I may finally be getting close to getting a scope, which I have hoped for for the past year. This entry was posted in Alberta Birds, Birding Events, General Birding, Great Canadian Birdathon, Spring and tagged Great Canadian Birdathon, Thank You. Bookmark the permalink. Big congrats on exceeding your goal PrairieBirder. I hope you have a marvelous time at the Baillie Birdathon and that you get the scope you have been hoping for. Thank you, Mia I can’t wait for the big day! You are very welcome and good luck with the Birdathon! Have a wonderful 24 hours birding! I read on the Birds Calgary blog that you have ordered your scope, hooray, sure hope it arrives in time. I am a brand new birder also (although starting much later in life than yourself.) It’s so much fun I wish I had started long ago. 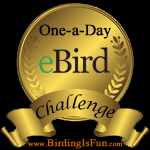 I was very happy to sponsor you in the Birdathon and look forward to hearing all about it. Have fun! Hi Susan, thank you very much for your donation to my birdathon. I’m so happy to have exceeded my goal and almost equally happy to have ordered a scope. Now the hard part, waiting for my scope and the birdathon!